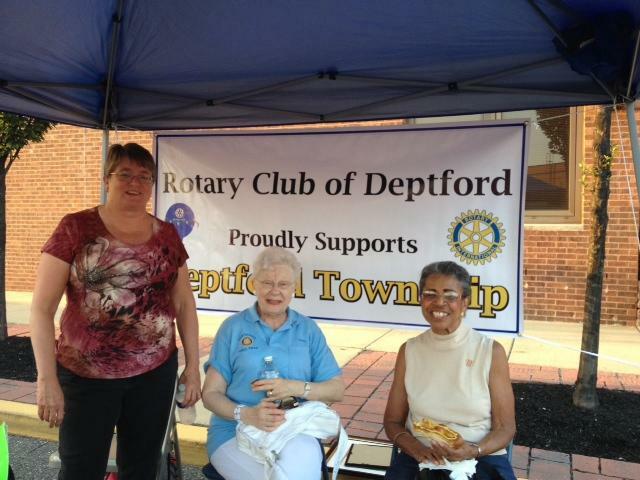 The Rotary Club of Deptford is hosting its first fundraiser of the year, “Jazz It Up”, featuring the award‐winning Deptford High School Jazz Combo. The event will be held on Monday, June 5th from 7 p.m. to 9 p.m. at Filomena Lakeview Restaurant. Join us for a night of fun and great music while helping us raise money for our organization. meals on wheels cannot deliver due to inclement weather. This year we are also providing new, exciting books and magazines for every school in Deptford Township to help encourage a love of reading in our students. Our goal is to raise $10,000 this year and do to that we need your help! Tickets are available through any Club member or can be purchased online through PayPal. Fun in the workplace is not just for tech companies! 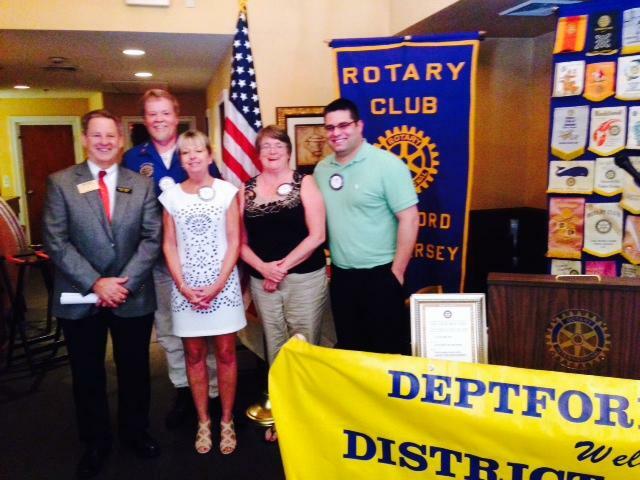 Deptford Rotary proudly acknowledges Mrs Lorna Manahan Pallma Past President and Daniel T. Howell, Vice President of the Deptford Rotary club District 7640's Rotary club. see below. Left to Right: President, Pat Egberts. PP, Lorna Manahan Depalma. PDG David Wright Sr. 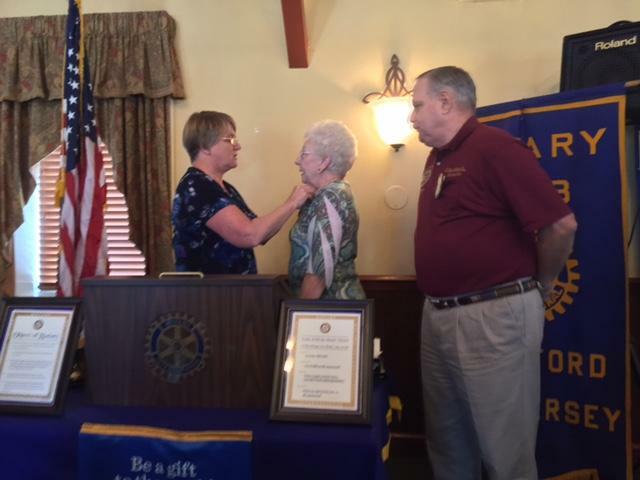 Installing our newest member, Alice Cupaiuolo Esquire to our club, Welcome Alice. 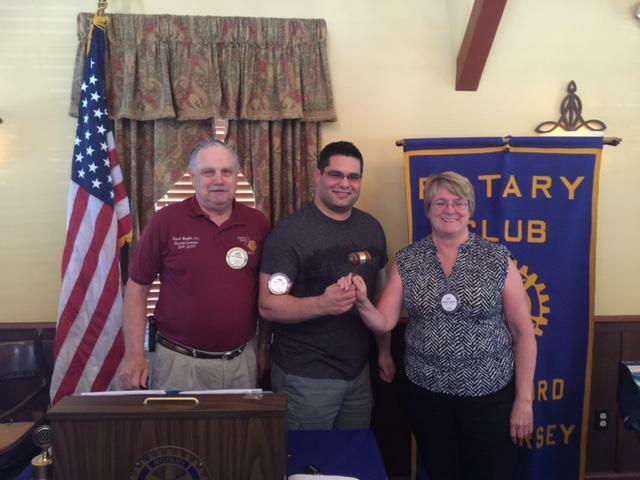 It is again another year, 2014 - 2015 was an awesome year and now that the 2015 - 2016 year starts, we install our new club President and officers. As we are growing as a club, so do our relationships with one another and community, Learning as a family to do good for Mankind. Lets have another GREAT YEAR! !, growing and bringing positive energy to the club, community, the lives of those we touch everyday. REMEMBER; "Were this Close"
Congratulations to Dom, for a year well done as President, Congratulations to our Officers who's true "Service above self" is well evident, and Congratulations to Pat Egberts our new President. 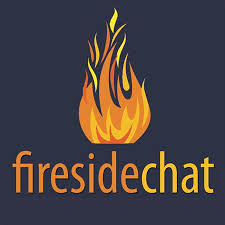 I have to say, Thank You to all who attended and brought a friend to our meeting on Friday, May 1, 2015. Special thanks to our Mayor, Paul Medany and The Chief operations officer of Numours DuPont Pediatrics, Paul Kempinski for excepting our invitation. We like to also welcome Nemours and there new Pediarics center to our community as well. It was wonderful to see all who attended and I say, thank you!! I've posted some pictures for your pleasure, Thanks again to all who attended. 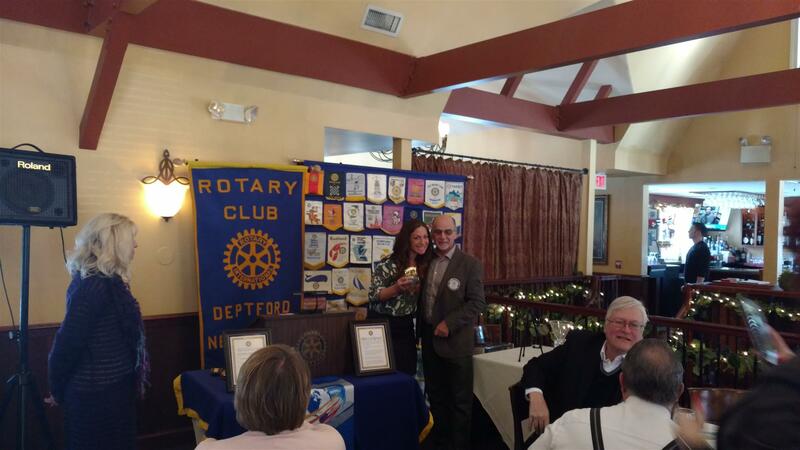 Below: Presentation of ceremonial Pig, Neil To Paul Kempinski for giving an informative Power point presentation to our group on what Nemours DuPont is achieving through out our many communities. Thank You Paul. We like to thank our Special Guest. 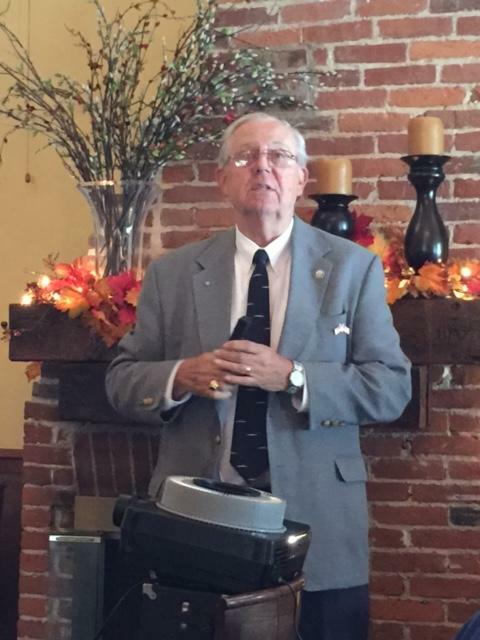 Assistant Governor, Don Kensey for attending or Friday April 24, 2015 meeting at Filomena Lakeview Inn. Thanks Don, enjoyed your company. 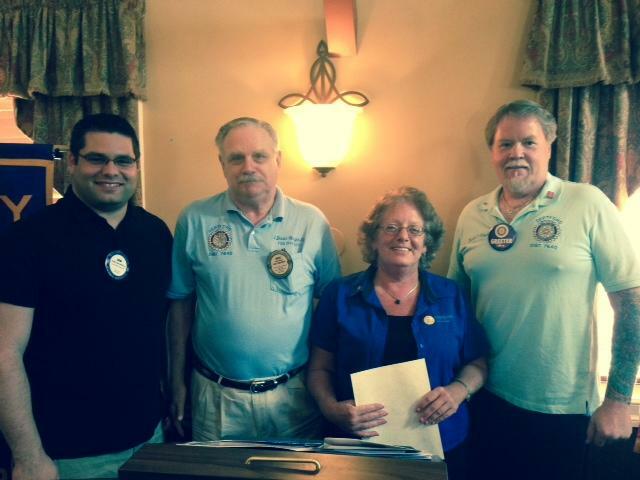 Our club appreciates Roger and Dorothy Stockman attendance at our 04/10/2015 Friday meeting. 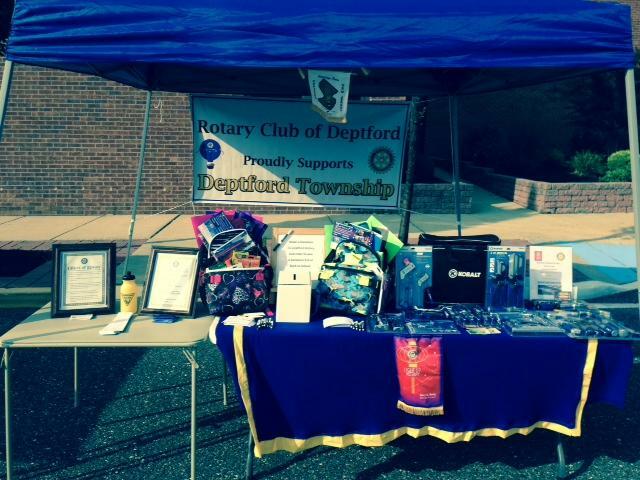 Deptford Rotary Proudly sponsored the church every year for this service. Thank you Mr. & Mrs. Stcokman for your thoughtfulness and caring where other wise our seniors would go with out. 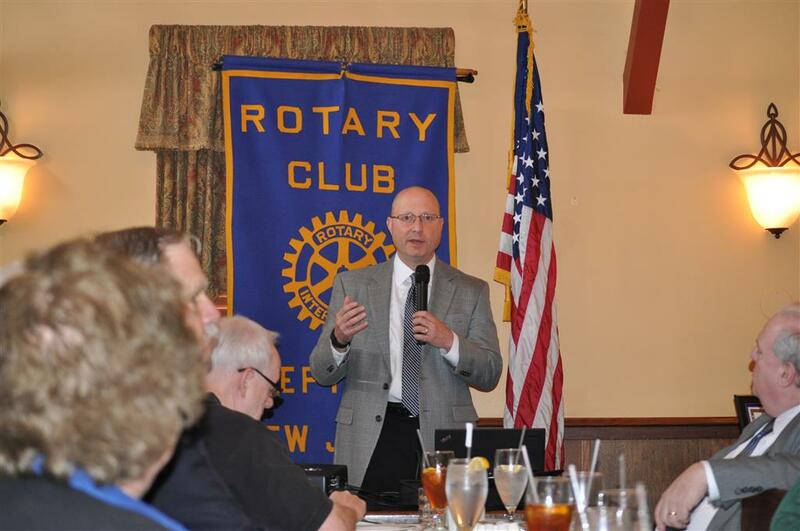 Hello Everyone, Fridays speaker will be Mr. Roger Stockman with the United Methodist Church. He will be speaking about the Blizzard Bags. 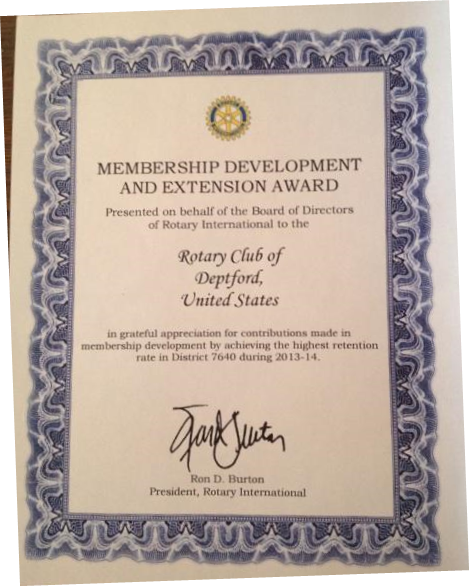 We at Deptford Rotary would like to say how wonderful it is to have our members recognized for what they do for Rotary and our community. 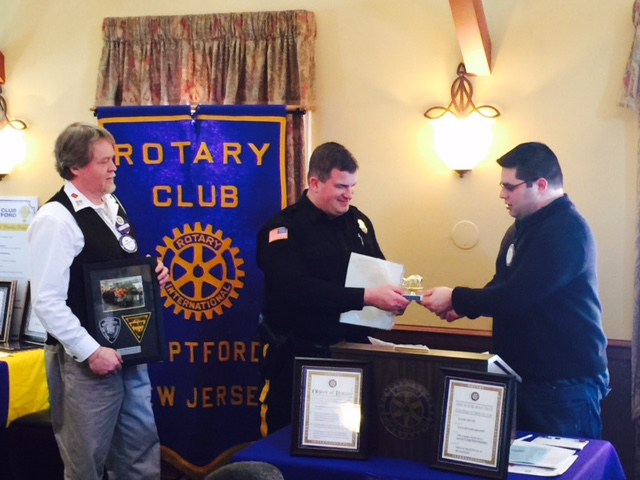 The Deptford Township Police Department Officer Eric Struose who is our SRO, (School Resource Officer) at Deptford High and Deptford Township Police explorers club were on hand to give one of our own, Daniel T. Howell an award for appreciation for his support to the Deptford township Police Explorers club from Deptford High School. Members of the explorers read their letters of appreciation to Dan and were thankful for him noticing their accomplishment and for him sending them to a Philadelphia Flyers Game w/ club box and lower level seating.Seen Below on left, Dan Howell, Secretary, Left and Officer Eric Strouse on right. Also Our President Dominic Alessandrini, right, Presenting our ceremonial pig to Officer Strouse Center, for speaking about the Explorers Group at our meeting. MR. Mike Simone, Congratulations Mike, enjoy the game!!! 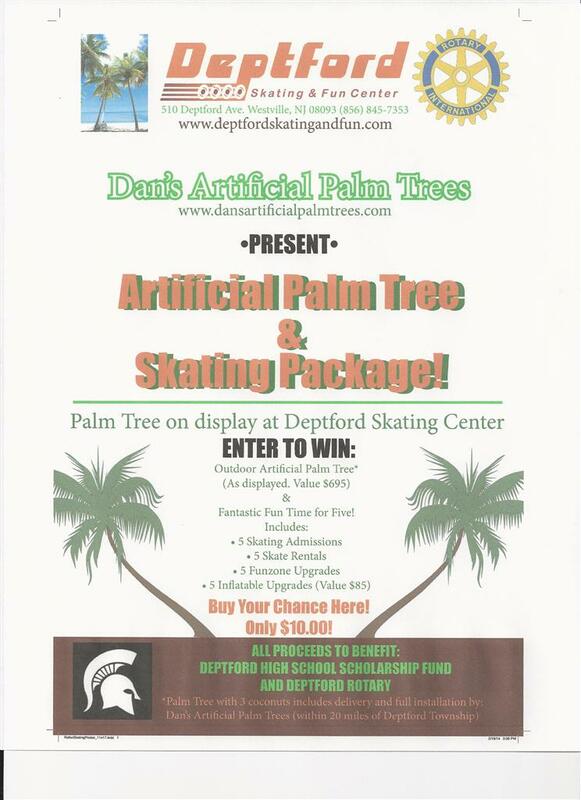 Special Thanks to Mr. Nick Mazeika and Mr. Charlie Kirchner from The Deptford Skating and Fun Zone for their support an for hosting this event. 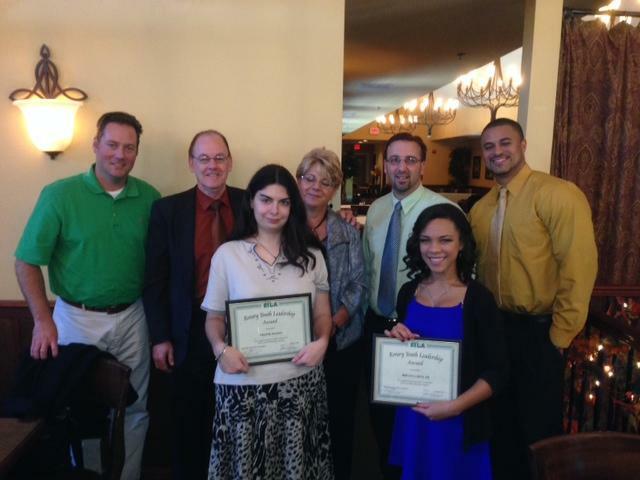 2014 Holiday Party @ Filomenas Lakview, Deptford N.J.
A special thank you to Mr. Bob Morris and his wife JoAnne for attending our meeting this week. Mr. Morris was the Principal at Lake Tract School in Deptford NJ and is in retirement and now volunteers at the Battle Ship NJ in Camden. Bob gave an informative presentation on the Battleship NJ and along with a slide show Bob gave the group many facts on its large Guns, lodging, and the history of its origin. Thank you Bob and Jo Anne for your thoughtfulness and your dedication to a such a decorated ship. I am currently working on the 12/12/2014 Christmas party table Sponsors, as most of you are aware we ran out of tables last year to the overwhelming response. This year we have added more tables and the Donation for a sponsored table is the same as last year, $100.00 for (6) six guest and an additional $20.00 for each additional guest there after. 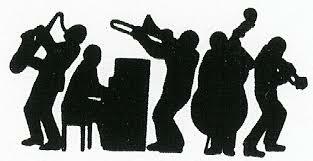 Remember we will have the Deptford High School Jazz Band attending as they were Great!. Last year. We will also have our real life Santa, (who else??) and good friends. So please come and join us as we say thank you to all our community based Businesses, Friends, associates and special Guests, School personnel as well to those who help us through the year. Hello everyone. Please take the time and spread the word for this fund raiser, we have not had and fund raising done since National Night out which was small but never the less a fund raiser. 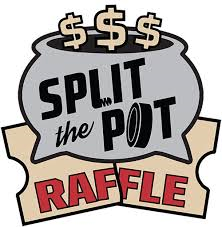 Nick Mazeika and I, Dan Howell, Have taken the time to draft up the flyers and donated (6) six tickets which are section 107 row 13 seats 7-8 they are shoot twice side lower bowl and come with Cadillac Grill and VIP access a $400.00 package. 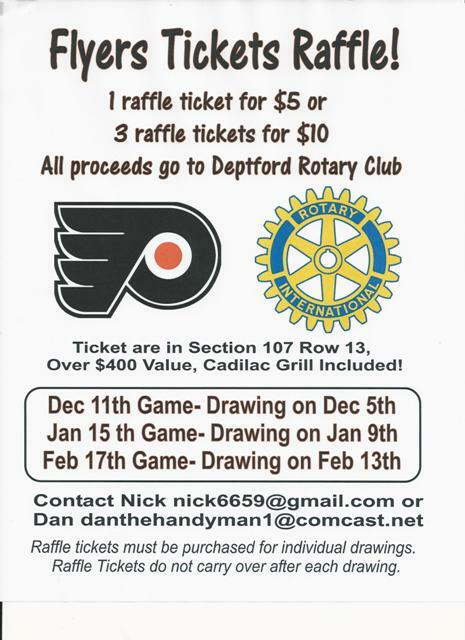 One set, 2 tickets to each game, For each month starting December, to be raffled off and all proceeds to be donated to our club, I will be picking up Raffle tickets Saturday and will have them available for purchase or I can supply those who believe they can sell. We would like to extend a special welcome and thank you to our acting school superintendent, Paul Spavanti, Principal, Melvin Allen, also Mr. Mark Patito and Guidance councilor, Lauren Pallies for escorting our last years RYLA students, Ms. Marissa Steinmetz and Mr. Gianlucca Solari.to our meeting. 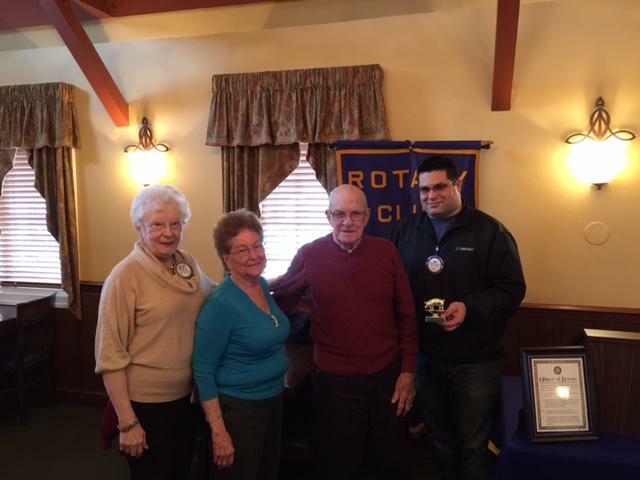 Thank you and we hope your lives keep in the Rotary family and live the life of: Service Above Self"
Pictured from left to right: Pat Egberts, Vice President 7640, Daniel Howell, Secretary 7640, RYLA Student, Gianluca Solari, RYLA Student Marissa Steinmetz and President, Dominic Alessandrini. 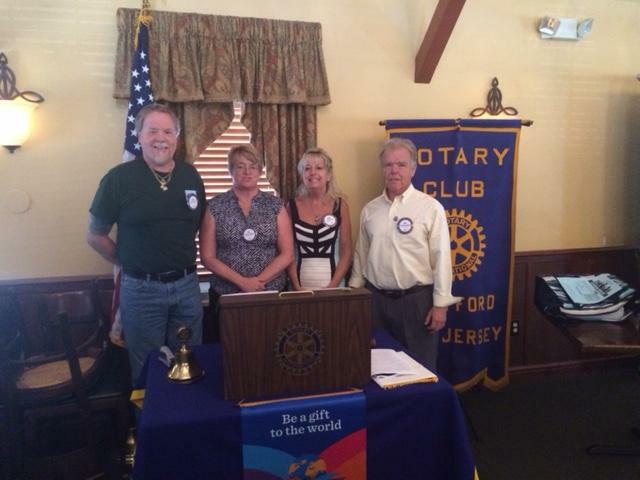 Congratulations to our newest member, Debbie Dukes, Welcome to the club!!! 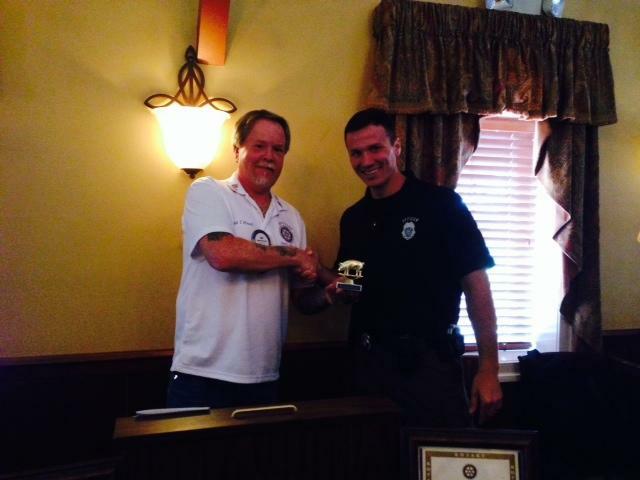 Seen Below, left, Secretary, Daniel T. Howell presenting our ceremonial Pig to Investigator Sean Wentz. As you know Deptford was known for all its Pig farms in the Township. 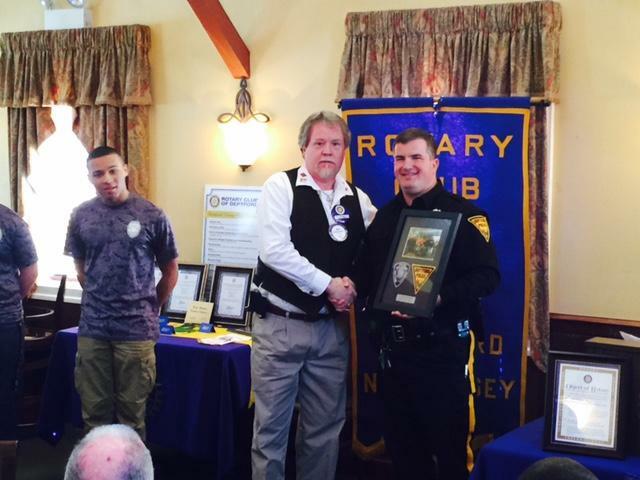 Deptford Township Detective Shawn Wentz will be our guest speaker this week, . 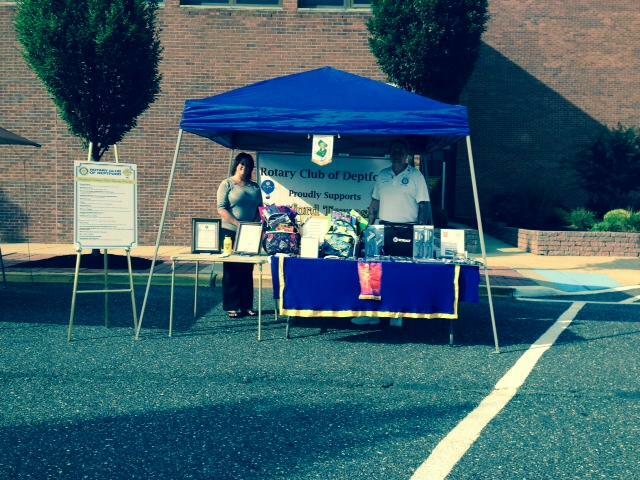 Investigator Wentz, is our Deptford Township School Resource and D.A.R.E Program officer. 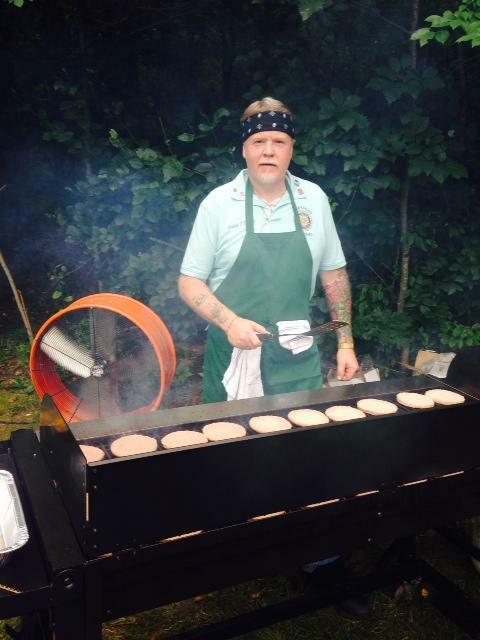 Deptford Township Mayor and Council 2014 Locust Grove bar ba Q was a GREAT! success. Plenty of food, drink, water ice, potato salad and Cole slaw. Special thanks to Dave from the Deptford Outback restaurant for donating the Ribs and wings. 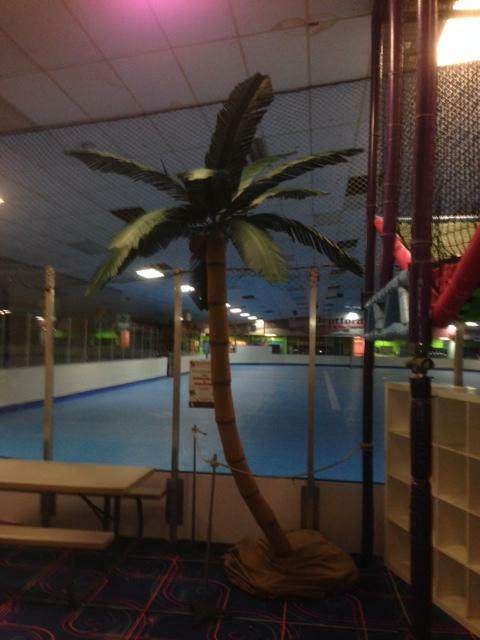 Also kudos to Charlie from the Deptford skate center for his volunteers from the skate center. Please join Governor Tim and the Leadership Team to enjoy an evening of FUN and FELLOWSHIP And IT’S FREE FREE FREE! In addition to the services described below you can download documents and/or find small business links to gather valuable information that will help you start or grow your business. Linking the resources of a variety of agencies contributes to the growth of the small business community in the State of New Jersey. These agencies include: The US Small Business Administration (SBA), the State of New Jersey , Rutgers Graduate School of Management (Newark) and other college-based centers throughout the State, and private sector. Through this combined effort, the small business community is able to promote the State’s economic development. All SBA programs are extended to the public on a nondiscriminatory basis. Reasonable arrangements for persons with disabilities will be made if requested at least two weeks in advance. 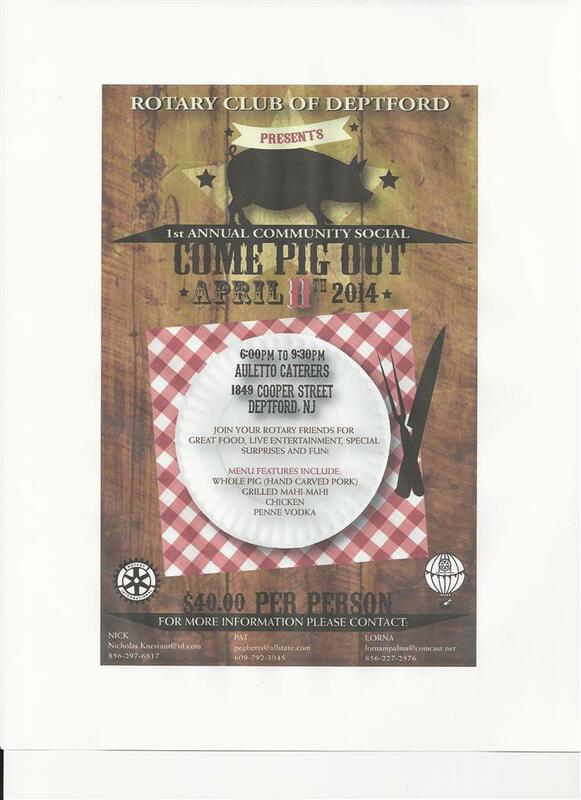 Contact NJ SBDC-Rutgers, Camden- 419 Cooper Street-Camden, NJ 08102 or call (856) 225-6221. The New Jersey Small Business Development Centers (SBDC) network is partially funded by the US Small Business Administration, the State of New Jersey and Rutgers Business School: Graduate Programs-Newark and New Brunswick. SBA’s funding is not an endorsement of any products, opinions, or services. All SBA funded programs are extended to the public on a nondiscriminatory basis. 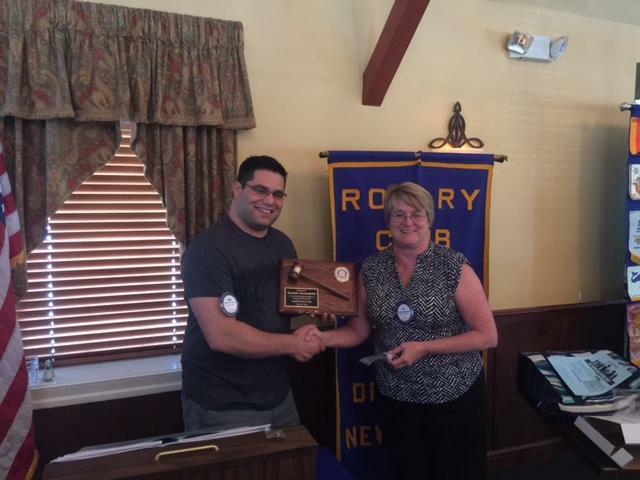 Congratulations to our new club President, Dominic Alessandini, Dom was our Vice President and treasurer for the 2013-2014 year and we look forward to a great year with him as president. It was nice to see all the clubs bring in their new officers and for all to come together to support the true meaning of "Service Above Self". It was a very nice Change Over lunch and all, (except for the traffic issues) had a great time. After serving 4 ½ years in the US Navy, Tim began a career in law enforcement in 1968 with The New York City Police Department. Upon graduating the Police Academy he was assigned to the Midtown South Precinct in Manhattan. Tim spent 15 years working the streets of Times Square and the Garment Center in various patrol and plain-clothes assignments. Tim retired from the NYPD in 1983. In 1983 Tim and his family moved to Vermont where they purchased and operated the Golden Stage Inn, an historic building and property near Okemo Mountain. Tim returned to police work in 1989 as Police Chief in St. Albans, VT and graduated from the FBI National Academy in 1993. 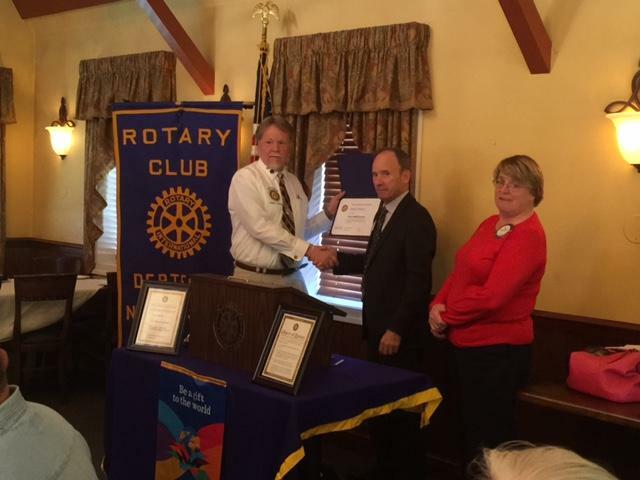 Tim has been active in civic affairs through the years and is a Past President of The Rotary Club's of St. Albans, Vermont (1994-95), and The Rotary Club of Atlantic City, New Jersey (2008-2009). Tim was an Assistant Governor in district 7640 (2009-2012). 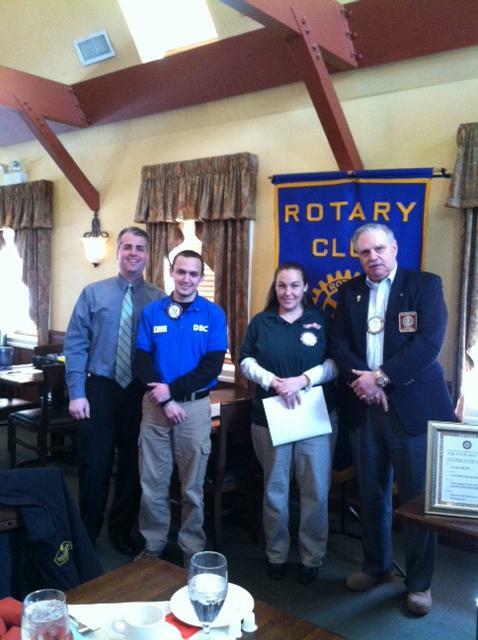 Tim and Shannon have hosted several exchange students and was a member of the district RYE Committee. Tim was also a member of the district Group Study Exchange Committee and Chair of the committee in 2012-2013. Tim has been his clubs GSE Club Coordinator for the inbound GSE teams for four years and has hosted team members each year. In 2010 Tim was the GSE Team Leader to District 2270 in Northern Norway. 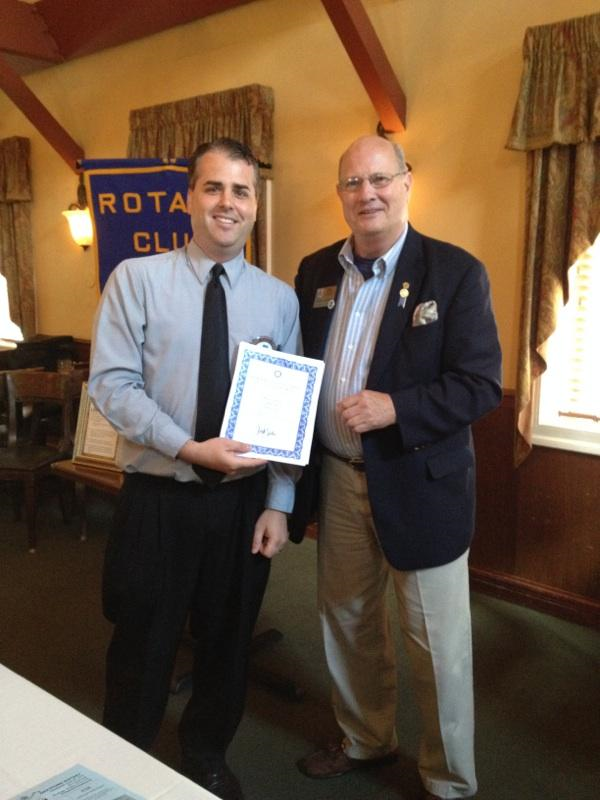 In 2011 Tim graduated the Rotary Leadership Institute. 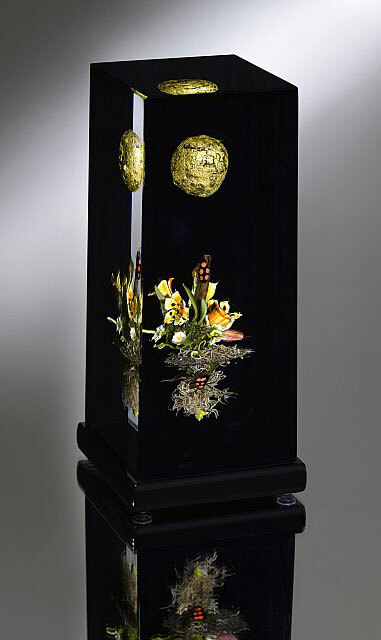 In 2011 Tim became a Paul Harris Fellow. Tim has been trained in Future Vision at the International Assembly in San Diego in 2013. 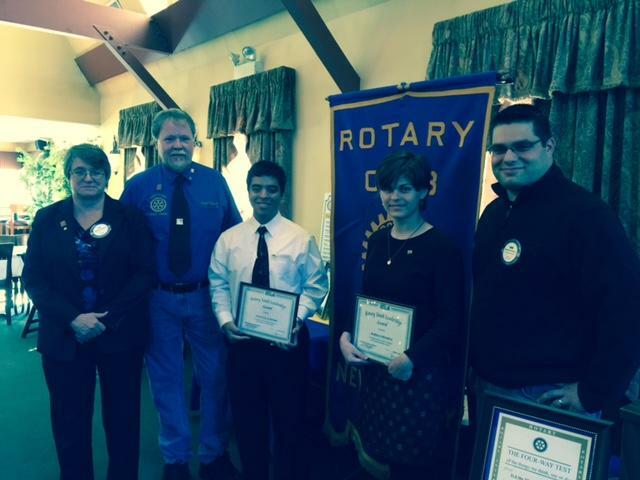 Tim attended the first Rotary Future Leaders Training at the Zone 24/32 Institute. 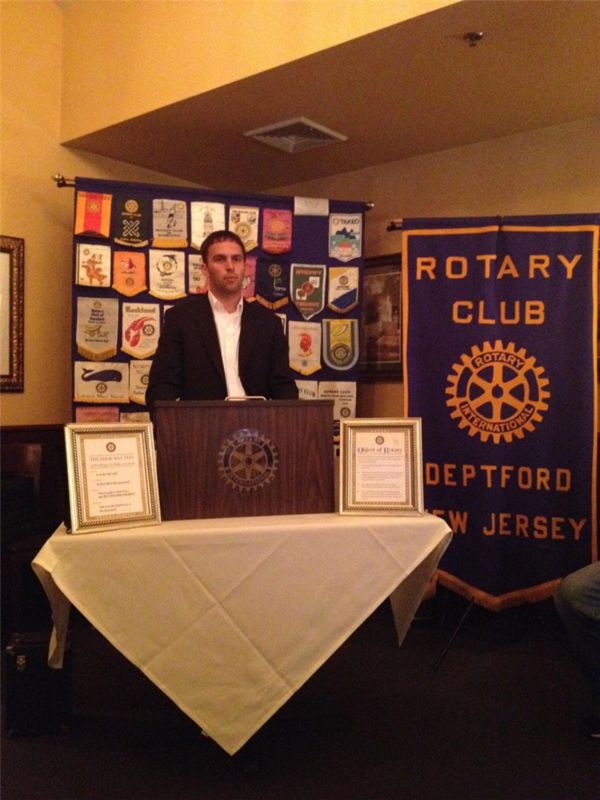 Tim is a volunteer Family/Community Mediator for the Community Mediation Services in Atlantic County. Tim lives in Egg Harbor Township with his Wife Shannon. Tim and Shannon have been married for 47 years. Shannon is a member of the marketing team for Atlantic Adult Day Care in Northfield. Tim and Shannon are proud of their two children, Christine 38, who is a Senior VP with the Bank of America in Charlotte, NC. Chris and Jason have 2 sons, Liam and Colin. Tim Jr. 35 is a Project Manager at Green Life Energy Solutions, in Absecon. In his spare time, Tim likes downhill skiing and tennis. 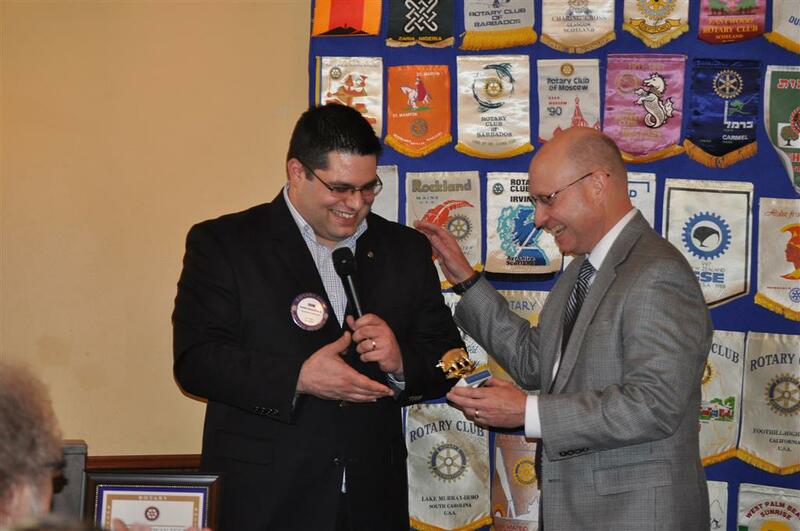 We all would like to thank our now past district Governor, Dan ceglia, Thank you for all your hard work and dedication and for being a wonderful guide and mentor and friend. 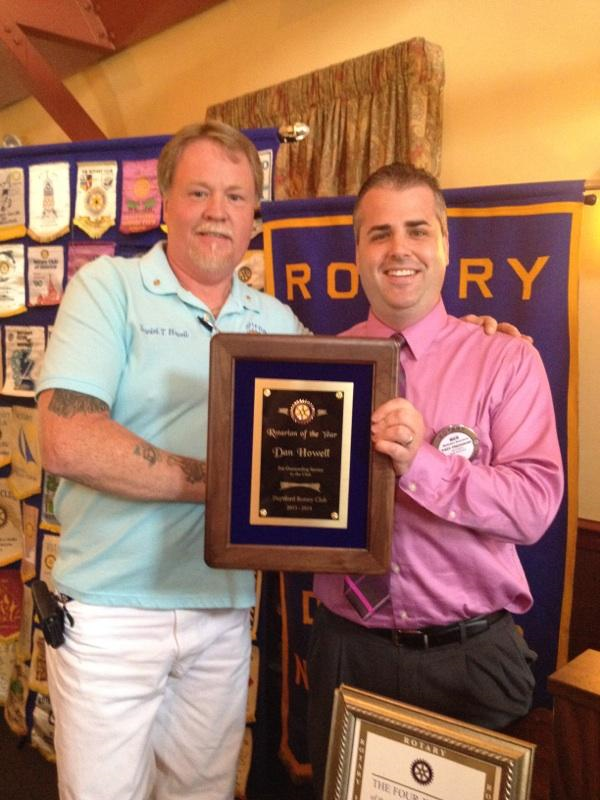 Our President, Nicholas Knestaut, has awarded Mr. Daniel Howell for his "Service Above Self" The Rotarian of the year award. Thank you Dan From the whole club and the lives you have touched. GREAT JOB!! 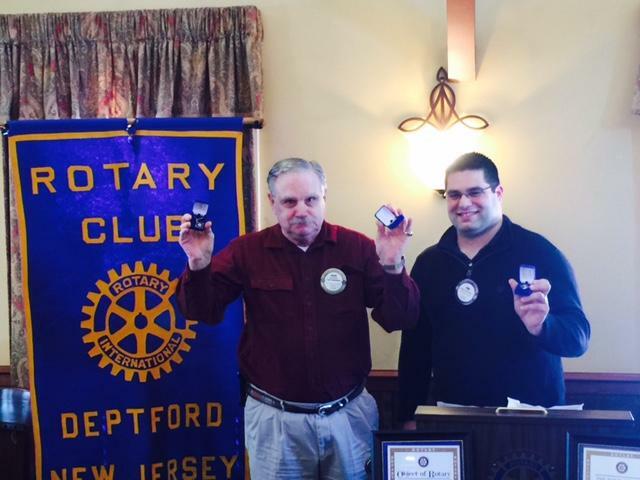 DISTRICT GOVERNOR OF ROTARY 7640, Daniel Ceglia and our current President, Nick Knestaut at our meeting on 6/13/2014 Our district Governor presented our Deptford Rotary Club With an outstanding 4 (four) Awards. And thank you to all our club members for with out us / we could not have done so much. Our guest speaker today, Frank C. Broomell, Jr.
Frank is running for the Democratic Nomination in New Jersey's First Congressional District. Frank Broomell volunteered to serve and fight overseas for the democracy that we value so highly in the United States, and he believes that it is essential for the voters of the First Congressional District to have a choice. 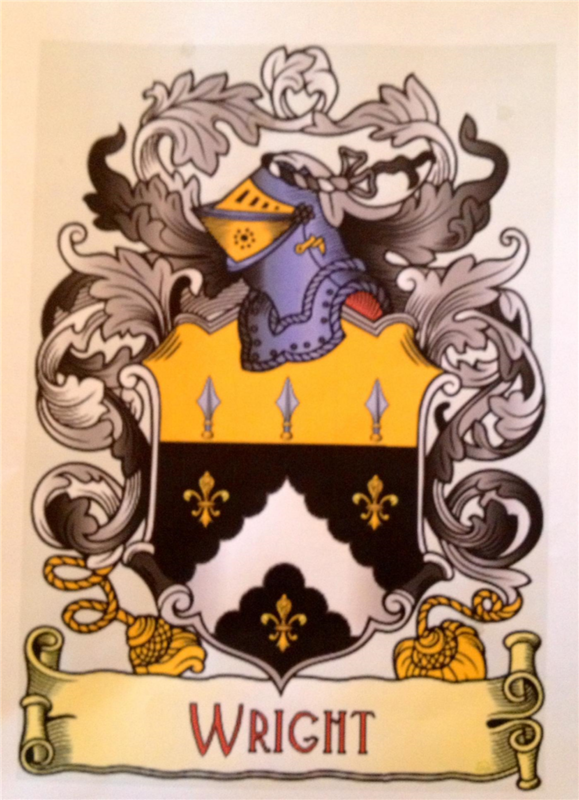 Frank Broomell was born and raised in South Jersey. He spent most of his life in Sicklerville, NJ, the son of two working class parents. They sacrificed to ensure that Frank and his brothers could receive the best education possible. After graduating from St. Augustine Prep, Frank attended college at George Washington University. While there, Frank knew that he had to give back to the country that had given his family so much. His grandfather was the son of Italian immigrants and received only an 8th grade education, never learning how to read. But through hard work, Frank's grandfather was able to start his own business and move his family out of Philadelphia and into the suburbs. It was the American Dream in action, and it continued during the next generation. While neither of his parents graduated from college, they worked hard as a truck driver and school secretary to place Frank and his brothers in a position to succeed. And so, with America in two wars and increasing the size the Marine Corps, Frank saw an opportunity to give back. He attended Officer Candidate School in 2008 and commissioned as a Second Lieutenant in 2009. After initial training, Frank was selected as an Air Intelligence Officer. He served with both 3rd Marine Aircraft Wing and Marine Heavy Helicopter Squadron 462 in San Diego, deploying with both to southwestern Afghanistan on separate deployments. In that capacity, Frank and his Marines worked to analyze the enemy threat and help their pilots reduce their uncertainty. Always willing to help, Frank volunteered for additional duty while with the helicopter squadron as a door gunner/aerial observer. He also worked to maintain accountability of the gear and expensive equipment utilized in the intelligence process. While in the Marines, Frank received several personal awards including two Strike/Flight Air Medals and two Navy and Marine Corps Achievement Medals for his performance during deployments to Afghanistan. He was also placed in the top 17% of officers screened during an education selection board for junior officers. However, with the Marine Corps reducing its size both in Afghanistan and back home, Frank decided to leave active duty and head back to school. He was promoted to captain in the Marine Corps Individual Ready Reserve shortly after leaving active duty. Leaving the Marines did not mean leaving public service. Frank is still committed to serving the country he loves. He decided that the best way to prepare himself for service after the Marine Corps was to work on a masters degree in public policy. For that degree he enrolled at Harvard University's John F. Kennedy School of Government. There he is learning from the best in the country about the policies that can keep America moving forward. A special thank you to Frank for sharing his views, concerns and ambitions with us today. 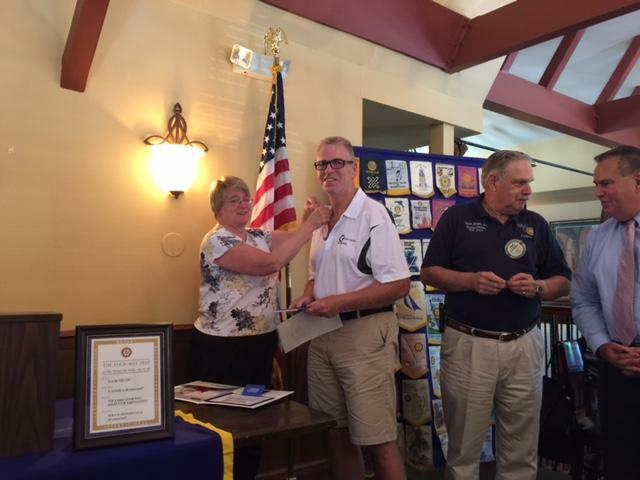 Dave was very informative as to his past merits and accomplishments, he was joined and supported by his wife, Friends and club members. Thank you for visiting and coming out to support Dave. 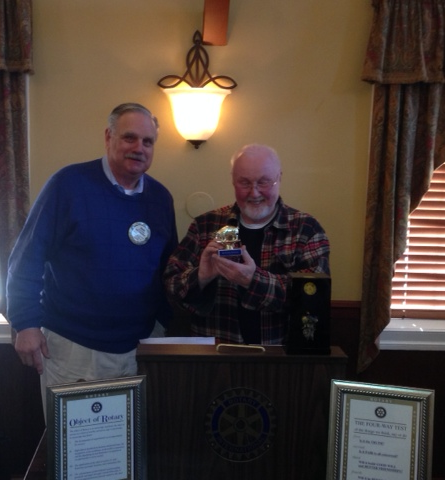 Pat Egbert's was selected as the winner of our Drawing on 4/25/2014 @ the Deptford Rotary Meeting. thank you for all who bought chances and good luck next year. 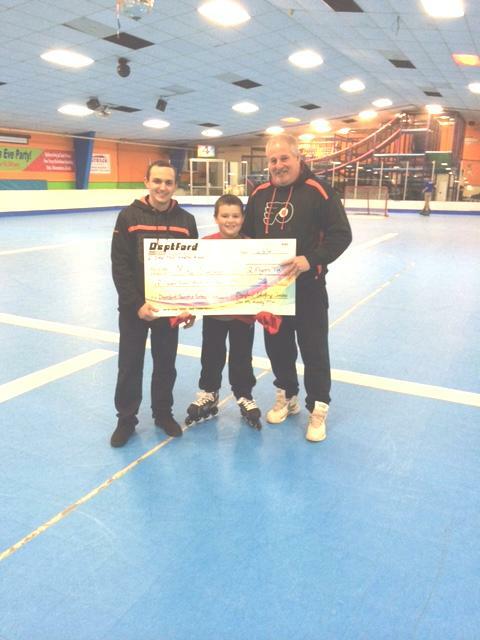 Nick Mazeika, Deptford Skate Center Manager and Anna Dolphin, ServPro of Deptford Manager. 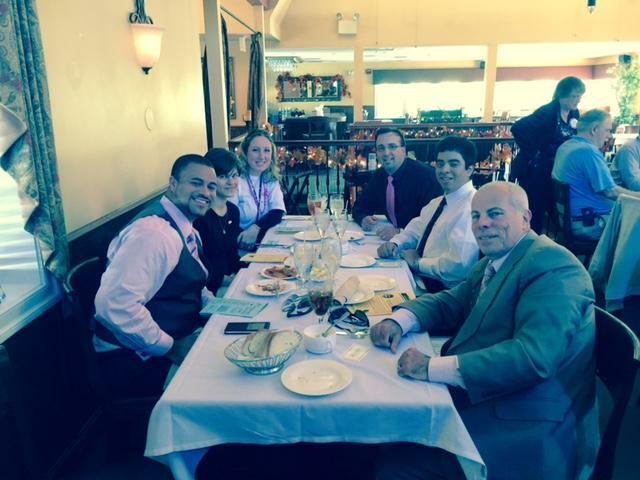 Pictured from left to right, our President Mr. Nicholas Knestaut, Nick Mazeika, Anna Dolphin and PDG, Mr. David Wright Sr.
Friday's Meeting,11/08/2013. 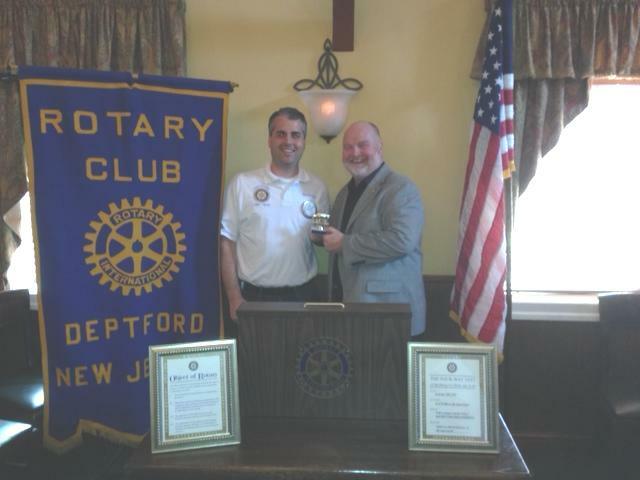 We at the Deptford Rotary District 7640 would like to extend a special thank you to: Les Vail, President/CEO of our Gloucester County Chamber of Commerce, Thank You Les, your Speach was informative and inspiring. 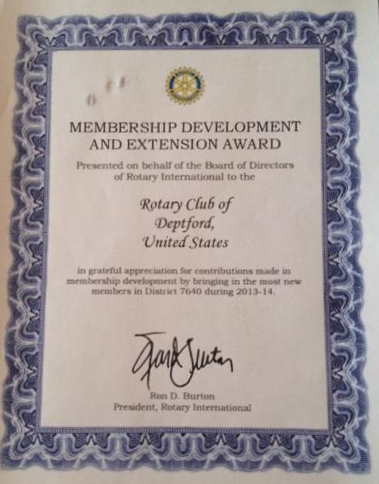 Deptford Rotary Club is moving Friday, May 31, 2013!! 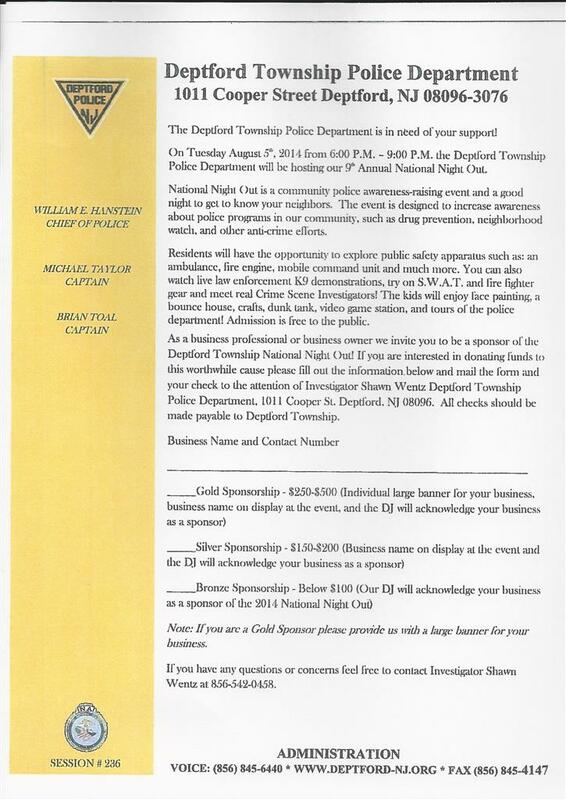 Look for more information on our Fundraiser Event to be held t Adelphia Restaurant on May 9, 2011!! 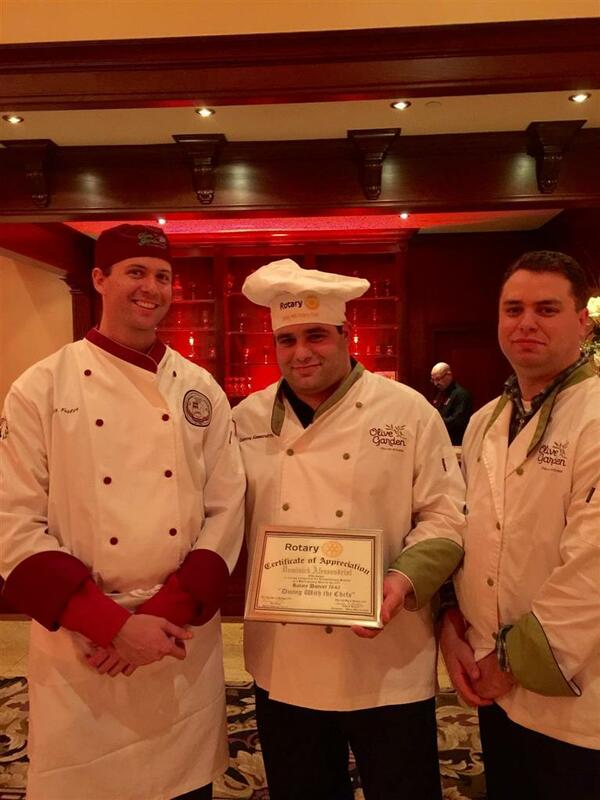 Congratulations to President Dominic Allessandrini, Winning for the the forth (4th) time in the professional chef category division. President Dom made a Smoked Mozzarella Chicken. 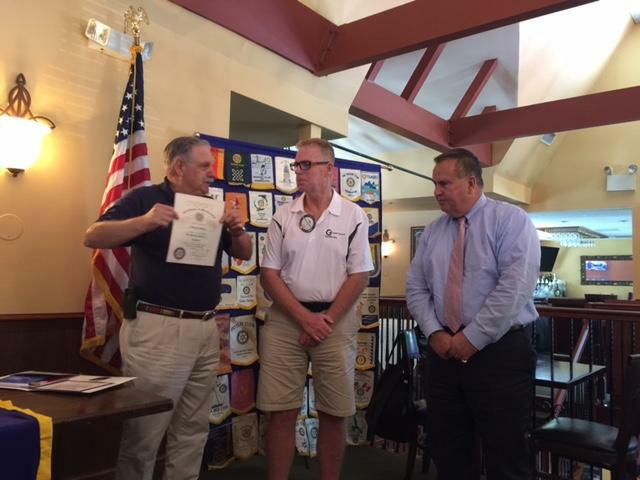 Shown below, Left to right, Chef Matt Martinez,Chief Operations officer, Olive garden, and current Deptford Rotary 7640 President, Dominic Allessandrini and General manager olive Garden, Peter Foster. 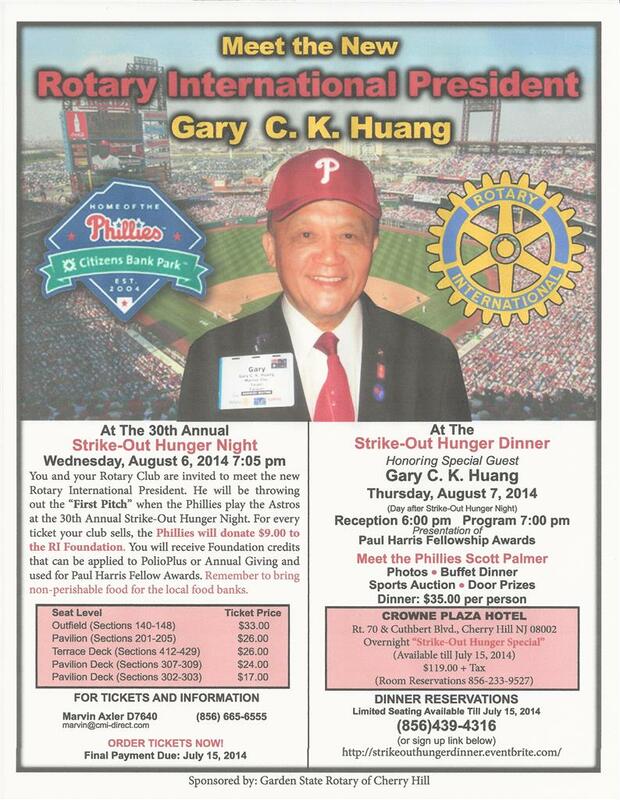 You and your Club are Invited to meet the new Rotary International President Gary C.K Huang 2014-15 at Strike-Out Hunger Night, Wednesday, August 6th and Dinner, Thursday, August 7th (See attached SOH Dinner flyer). In appreciation for our 30th Annual Strike-Out Hunger the Phillies will now be giving back to the Rotary Foundation “$9.00 on EVERY ticket” sold. Each participating Club/District will receive RI Credits that can be applied to PolioPlus or Annual Giving and be used for Paul Harris Fellow Awards. And to make it even better, The Bill and Melinda Gates Foundation will be matching 2 for 1 each dollar raised for PolioPlus. That’s $9+$18= $27 for the Rotary Foundation on every ticket. This is an easy way to get credits and raise money for the Rotary Foundation. 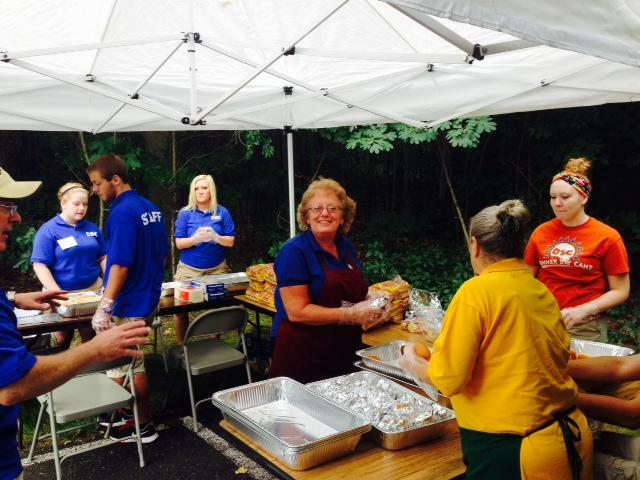 Strike-Out Hunger is a regional event involving over 200 Rotary Clubs in seven Districts in PA, NJ, DE and MD. 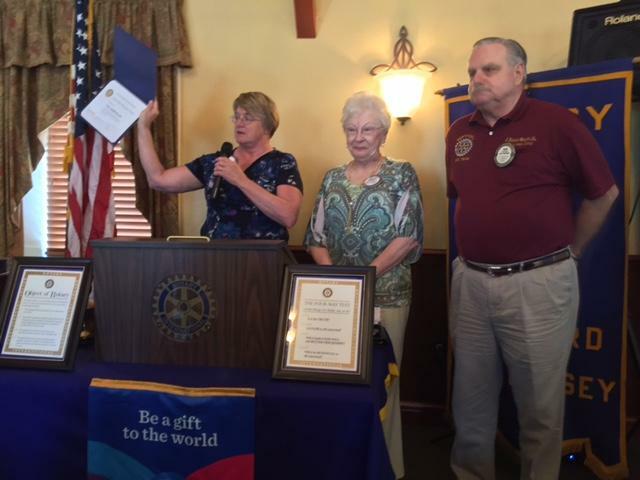 Thanks to the Phillies organization, the Rotary Foundation has benefited by over $855,000 to help eradicate Polio, plus TONS of food have been contributed to local Food banks. Good Seats are Still Available! There are still good seats available in the 100, 200, 300 and 400 Levels; from $17 to $33 each. Let’s make this 30th Anniversary the year we break the $1 Million raised mark and show The Foundation what Delaware Valley Rotarians can do. 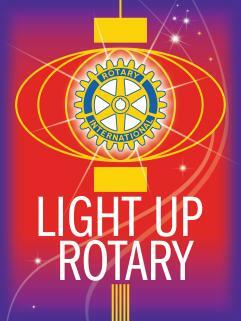 Remember, even the $17 ticket raises $27 for Polio Plus and the Rotary Foundation. 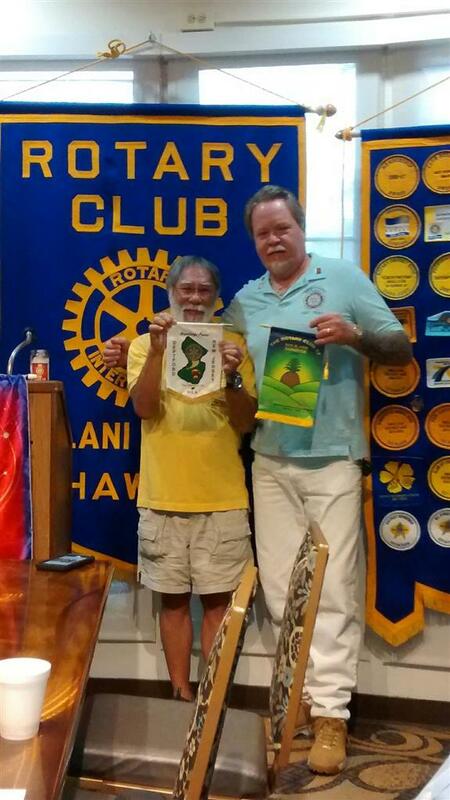 Thank you to our new district Governor Tim Datig for attending our meeting and for speaking to our club. Also a big thanks to our Assistant Governor Don Kensey for introducing Governor Tim. 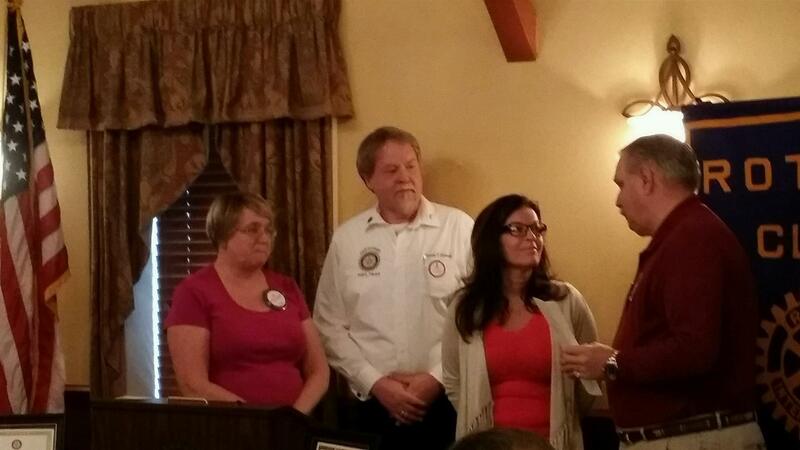 Governor Tim, inducted our new officers of the club for the new year. 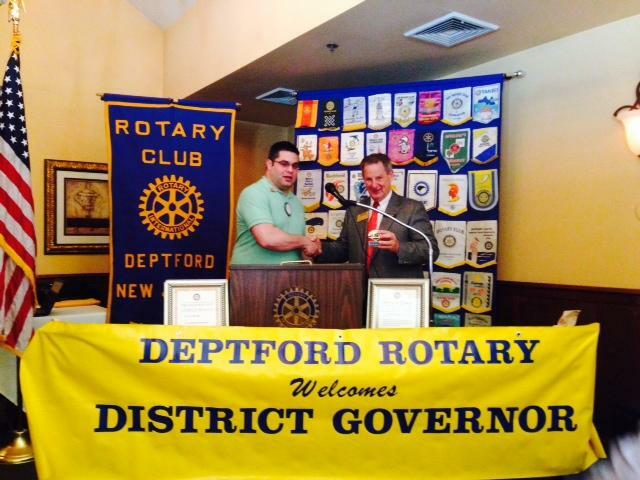 We Presented Governor Tim with our ceremonial PIG, as Deptford is know for their pig farms. The new year is looking awesome and as our past officers have done an awesome job, we as new officers hope to emulate their leadership qualities. Thank you to our past officers, Great Job!!! 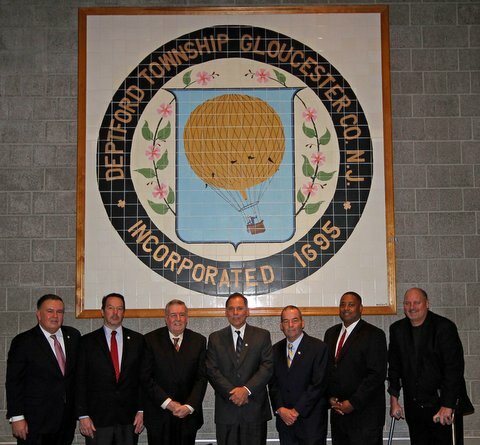 Top Left, Governor Tim Datig, President Dominic Alessandrini, Top Right, Governor Tim Datig,Treasurer, Anita Gates, Vice President, Patricia Egberts, Secretary, Daniel T. Howell and President, Dominic Alessandrrini. 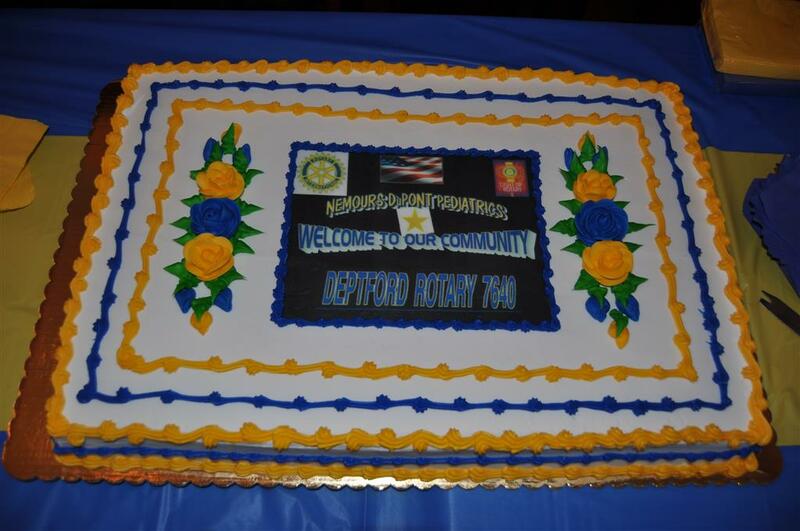 Congratulations and "LET LIGHT UP ROTARY"
We at the Deptford Rotary would like to say thank you to all who attended and for the support and donations from the community. Thank you for making this a such a wonderful and remember able event. Our Special Guest Speaker, 02/07/2014. 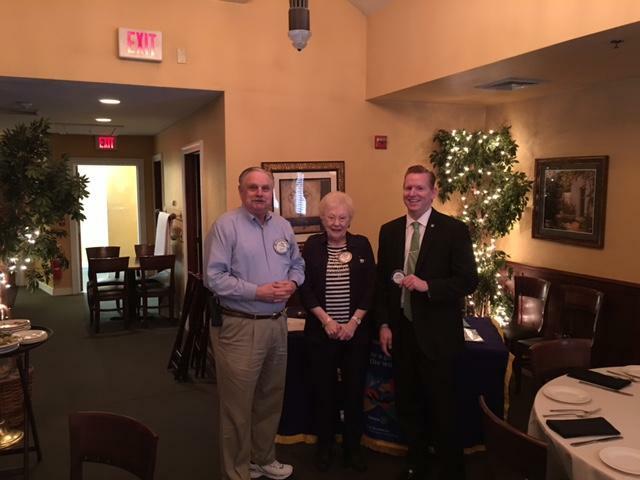 On right, Paul J Stankard and PDG J. David Wright, Sr.
Deptford Rotary would like to extend a special thank you to Paul for joining us Friday, at our meeting. Paul was quick with pleasantries and shared how he started in his profession. Paul had many laughing and listening with interest. 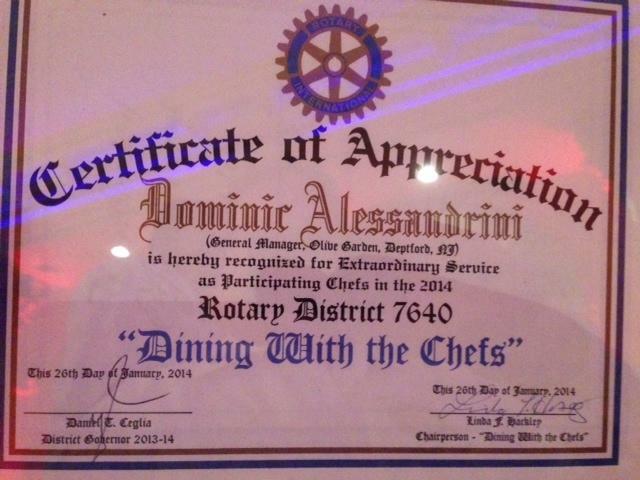 We would like to say Congratulations to our own Dominic Alessandrini. Dominic for the second year has Won first place in the professional division for Entrée;s.
Thank you to everyone who came and shared the day with Santa. 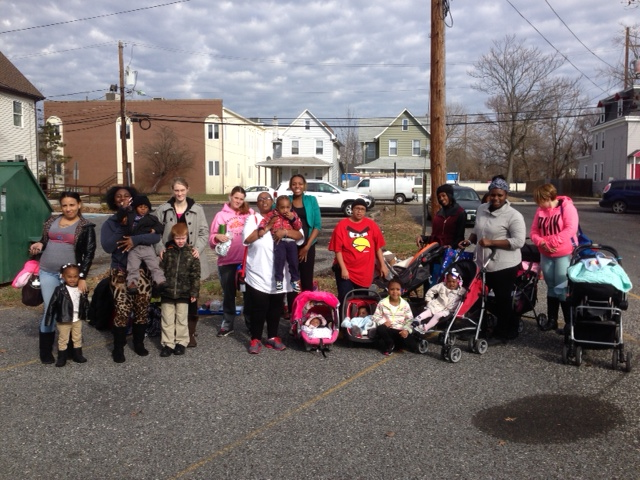 The family's from The Center For Family Services, (Mother and Child Residential center) had a heartwarming experience with their children and Santa. It was nice to see the smiles as Santa gave out presents to all the children. 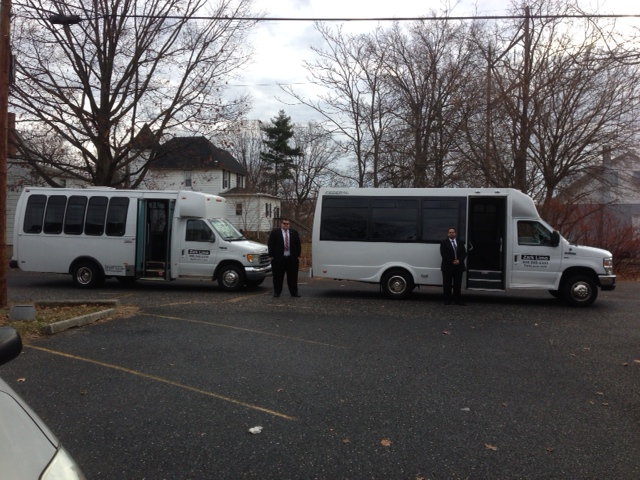 We at the Rotary of Deptford want to say how much we appreciated Mr. Daniel wynne of Zark Limousine Service, in Deptford, for providing limousine service for the families from the center. 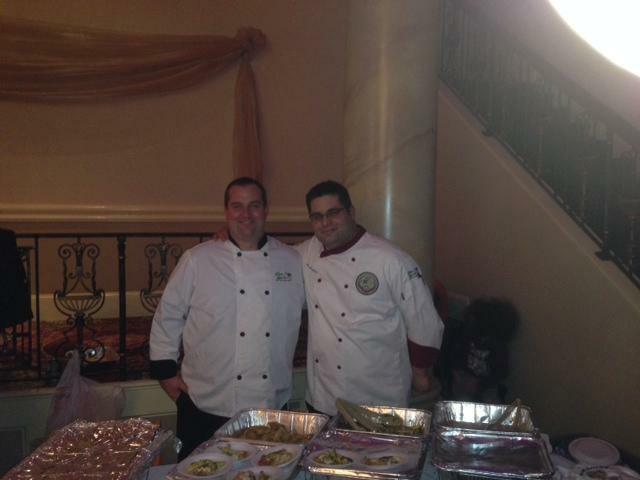 We also would like to say Thank you to Mario and Donna, Owners of Filomena's Lakeview Restaurant and Bar, Our Host for this spectacular event and to the staff for their help in making this day a success. Also our Rotary Members who helped in this endeavor, It was a very Pleasant event. Thank you all and Happy Holidays to all!! We cant for get Santa for showing up and warming the hearts of everyone there. 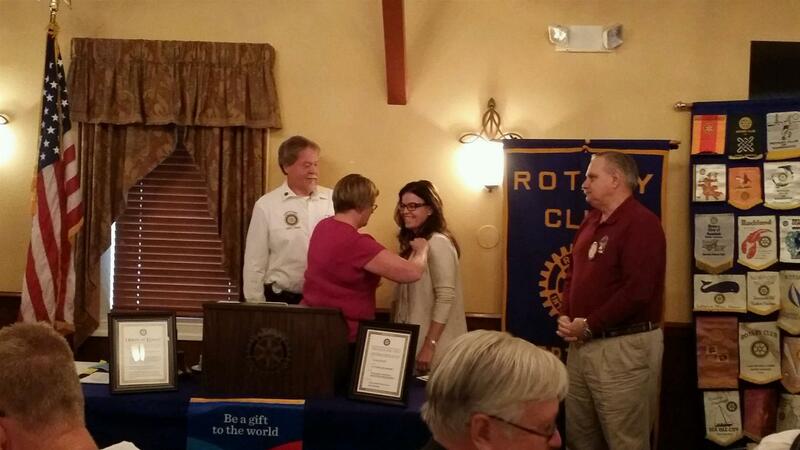 Congratulations to our newest member, Ana Barnett, Welcome. 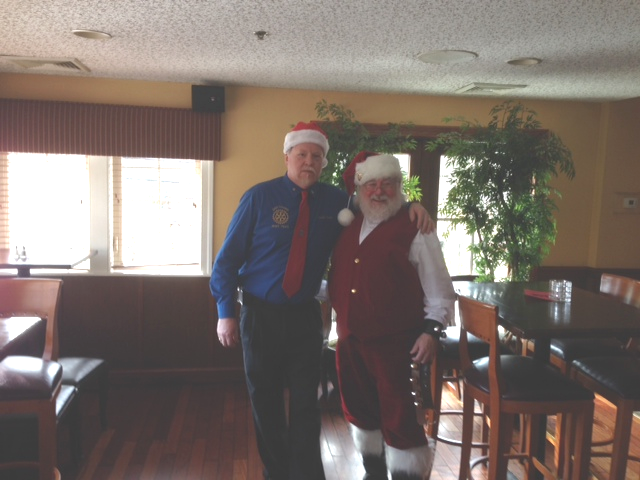 Hello everyone, just a note, Our Christmas party will be on 12/13/2013 @ Filomienas Lakeview Restaurant, 1738 Cooper Street, Deptford, NJ 08096 @ 12:pm Till 2:00 pm. 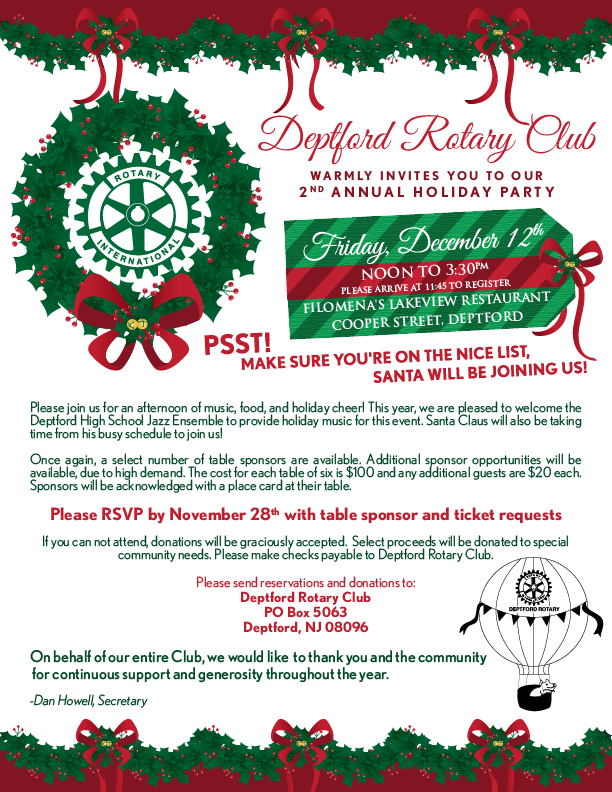 We will have a real Santa w/ real beard(Smiles) Please Make a note and we look forward to a festive afternoon, see everyone there, more to come. Milton Corsey, President and CEO of EVOLUTION Management and Consulting. 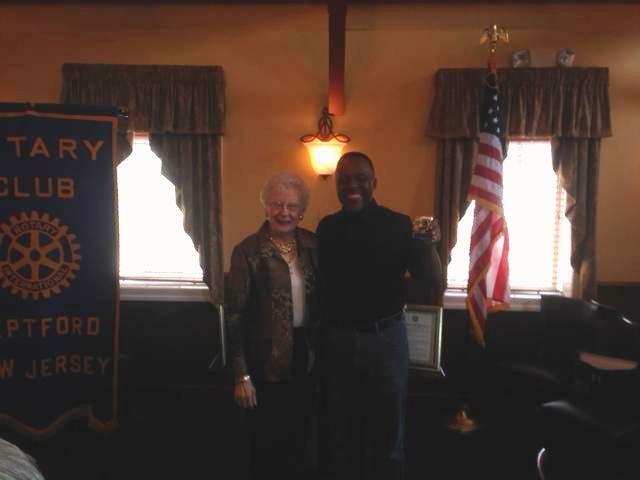 Thank you Sir, for speaking at our Rotary Meeting November 1, 2013. 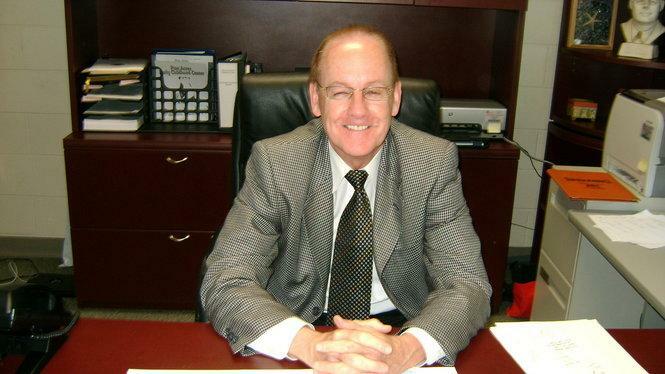 Congratulations to our newest member, Gary Loudenslager, The new Superintendent of Deptford Township Schools. 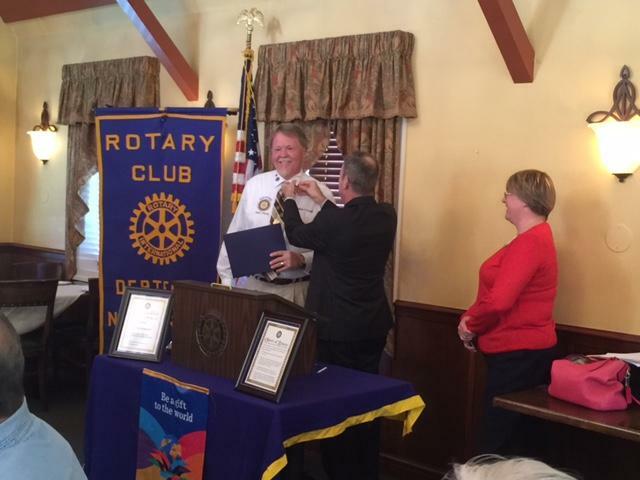 Gary was inducted at todays Rotary meeting. Welcome Gary. 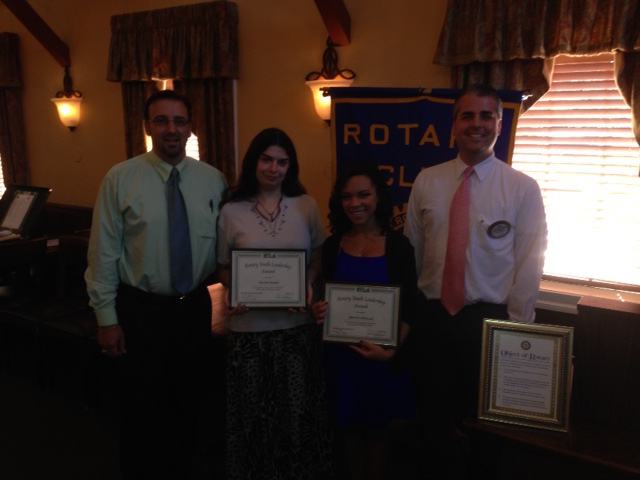 WE WELCOME OUR 2013-2014 DEPTFORD HIGH SCHOOL RYLA YOUTH LEADERSHIP AWARD RECIPIENTS. ALSO SPECIAL THANKS TO: COUNSELORS FROM DEPTFORD HIGH SCHOOL, PENNY QUENZEL, CLUBS HONORARY MEMBER, MARK PETITO AND GRAHM HALL. 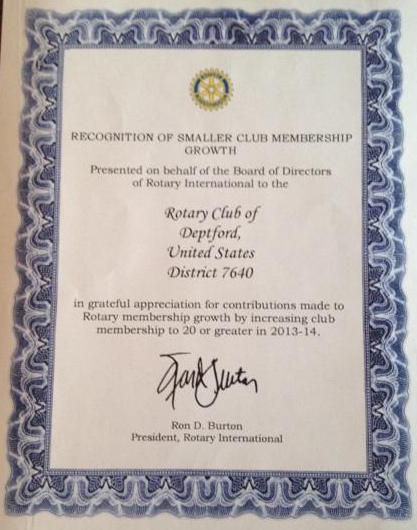 Deptford Rotary Has A New Home! Join us at our new location on Friday, May 31, 2013, Filomena's Lakeview at 1738 Cooper Street in Deptford. 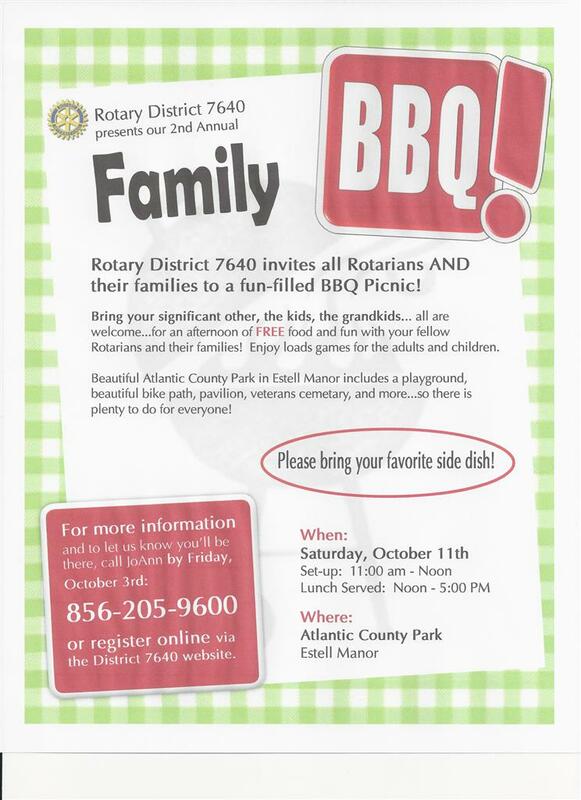 Our kickoff meeting will begin promptly at 12:15 with meet and greet with Deptford Township Mayor Paul Medany and our current club members and a fabulous lunch. 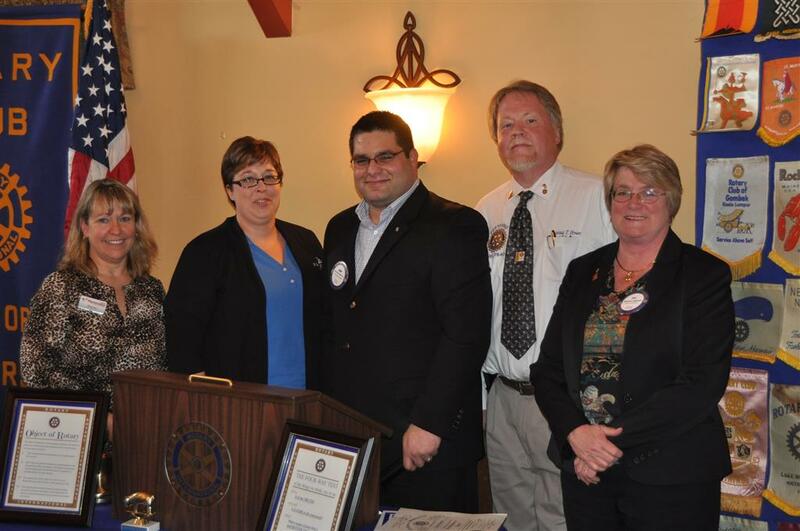 Our District Governer Elect, Dan Ceglia will speak about why he joined Rotary and how it has changed his life. 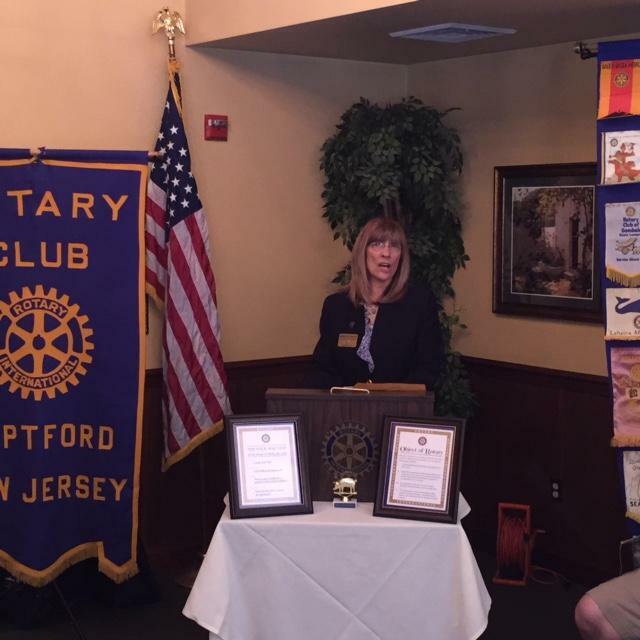 We will also hear some updates on things in Deptford Township from Mayor Medany. The cost is $12.00 per person and includes a sit down lunch. Don't forget to RSVP to Kim or Dave with your meal choice!! I look forward to seeing everyone there!! 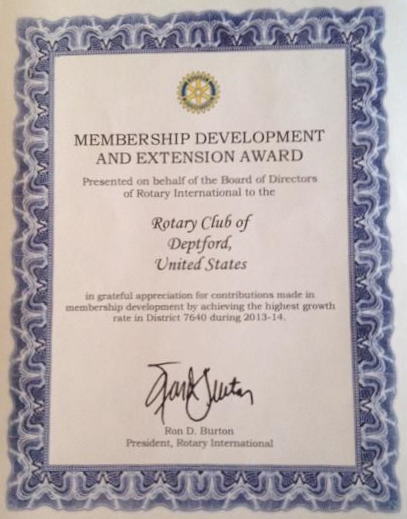 Deptford Rotary Gives back during the Holiday Season. We had a visit from our club's Youth Excahnge Student from Thailand. Posted by J. David Wright Sr.